Passwords serve the purpose of limiting who has access to your account. In order to get into an account, you have to know what the password is. For someone who has trouble remembering a password, it just seems easier to use the same password for everything. The problem with doing this is that someone can easily gains access to all of your accounts if they figure out your password. You should never use a single password for all of your accounts. It is the easiest way to give everything you have away to someone. Just imagine someone having access to your banking accounts, emails, and websites. This will lead to a lot of issues, including potential fraud. KeePass is the name of an open source password management program that is 100 percent free. It was designed to help you manage all of your passwords and login credentials in a safe and secure way. It is a database that securely keeps all of your passwords. Then, you just have to choose a master password to lock the file with all of your passwords. This makes it much easier for you to have access to all of your passwords without having to remember them. 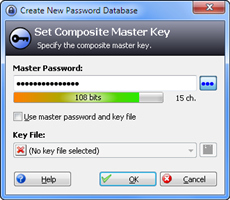 This program utilizes a Twofish algorithm and an Advanced Encryption Standard in order to encrypt the password database it utilizes. Both of these encryption systems are very secure. What is different about the security of this system? It is not just logging passwords, it is a security system that will protect all your passwords. The program was designed so keyloggers would not be able to access your password either. This is a portable program you can install on any USB drive. This means you can take the program with you wherever you go without having to install it on a computer. A lot of people feel more secure about having this option because it means the program and their password key files are not saved or stored on any computer. It also makes it easy for you to take your password database with you if you are someone who travels or uses a number of different computers. You can access this program through ports for just about any operating system. You can export files to TXT, HTML, CVS, and XML format. This makes it easy for you to access your passwords on any device without having to have a certain application to open the password files. This program offers password management in more than 30 different languages. It even comes with a password generator if you are someone who needs a little help creating a strong password. The last thing you will have to worry about is someone gaining access to your account, or your passwords while using this open source program.